Deck 15 from the bow of the ship to the aft elevators you’ll find many different kinds of sport activities for all ages of the family. 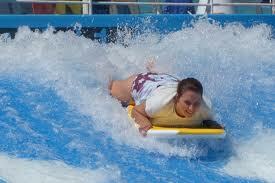 Flow Riders – Pools for surf boarding. No matter your level, you will find a challenge here. It is free. Main Pool for sunbathing and taking a dip. 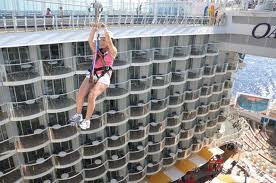 Zip lining across the top of the ship between two decks is not for the faint of heart. A rush!! 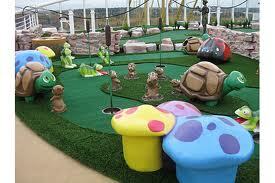 Miniature golf – on a moving ship!! Rock Climbing wall has all levels of difficulty. The Boxing Ring in the fitness center takes out your aggression. With all of this activity, you need to eat. The Wipe Out Cafe with make-your-own tacos, nachos, hamburgers and hot dogs will take the edge off. And drinks a plenty at the Wipe Out Bar. 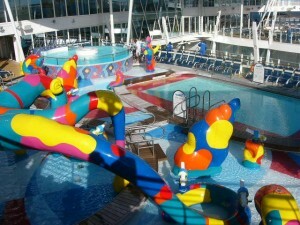 After all this activity, and if you are over 18, head out to the bow of this deck and rest in the Solarium loungers.